Classically Liberal: The story I didn't cover, but now will. When I read the story of Brendan Burke I almost blogged about it, but decided not to do so. It was touching but other matters got my attention. But his tragic death raises the newsworthiness of the story to a point that I can't ignore. Brendan was a hockey kid—a member of the royal family of hockey. His father, Brian Burke, is the general manager of the Toronto Maple Leafs and one of the most influential men in the sport. In high school Brendan made the varsity hockey team but withdrew. He played hockey as a goalie for Miami University and became student manager of the team as well. He was conflicted as to whether he wanted to go into hockey management as a career or pursue law instead. Part of his conflict was because Brendan knew something his teammates didn't know—he was gay. After a professional hockey game he and his father had a talk. Brendan told his father the truth. His father's reaction was entirely supportive. At one point he told Brendan they should spend the day together attending the Toronto gay pride festival. At university Brendan found his teammates were completely unfazed and supportive. As word spread the sports media picked up the story. Brendan, at one point had quit hockey because he feared his secret would be discovered. ESPN reported on the story and soon everyone knew. "I had a million good reasons to love and admire Brendan. This news didn't alter any of them. I would prefer Brendan hadn't decided to discuss this issue in this very public manner. There will be a great deal of reaction, and I fear a large portion will be negative. But this takes guts, and I admire Brendan greatly, and happily march arm in arm with him on this. There are gay men in professional hockey. We would be fools to think otherwise. And it's sad that they feel the need to conceal this. I understand why they do so, however. Can a gay man advance in professional hockey? He can if he works for the Toronto Maple Leafs! Or for Miami University Hockey. God bless Rico Blasi! And I am certain these two organizations are not alone here. I wish this burden would fall on someone else's shoulders, not Brendan's. Pioneers are often misunderstood and mistrusted. But since he wishes to blaze this trail, I stand beside him with an axe! I simply could not be more proud of Brendan than I am, and I love him as much as I admire him." The hockey coach at Miami University, Rico Blasi, says that Brendan's role on the team has been a blessing. He said he was "a great guy, personable and caring" and that the team had no problems with Brendan's sexual orientation. He said Brendan's honesty made him and the team consider how they expressed themselves: "We are much more aware of what you say and how we say it. I am guilty as anyone. We need to be reminded that respect is not a label, but something you earn by the way you live your life." The ESPN story brought out the bigots. There were the usual scurrilous, vicious attacks by the sexually insecure and religiously-stunted. But Brendan's life continued, until last Friday night. Brendan and a friend, Mark Reedy, had driven to to check out a law program at Michigan State University. They were returning back to Miami University when the snow storm hit. The car Brendan was driving hit an icy patch and slid sideways into an oncoming truck. Both Brendan and his passenger were killed. He was just 21, his passenger 18. 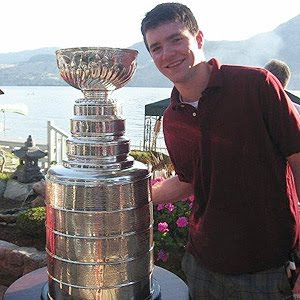 The Boston Herald proclaimed that Brendan's personal story "changed hockey's view of homosexuality." Maybe, maybe not. But Brendan's story did change a lot of minds. And it showed after the hockey world learned of his tragic death. At Miami University the team inscribed Burke's initials "BB" onto the back of their helmets for a game they played on Saturday. The game had a moment of silence in honor of Brendan. Coach Blasi said: "Brendan always had a smile on his face. He cared about not only his family but the players and everyone around him. Anyone associated with Brendan knew you could count on him. He was just an incredible person... he was a hard-working young man with a bright future." The Miami University RedHawks hockey team made the decision that they will fly to attend Burke's funeral on Tuesday. Miami assistant athletic director, Josh Fenton, said: "We want to be there to support the family because Brendan meant so much to us. We think it's important to be there." 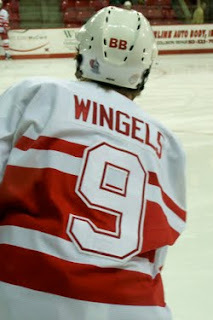 News reports said that RedHawks junior captain Tommy Wingels "fought back tears" and said: "I tried to stay focused, but everything going through your head is about Brendan. Not one guy is going to get through it himself. It's 27 guys and the coaching staff. I'm just so thankful to have them." 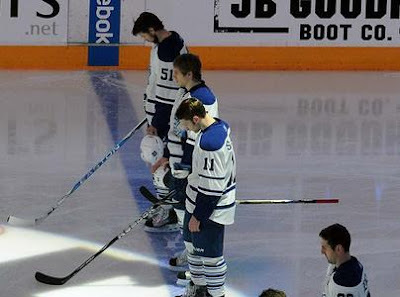 The Toronto Maple Leafs also decided to hold a minute of silence in honor of Brendan and said the entire team would also make the trip to attend his funeral. Brendan helped change minds. It was hard for him to do what he did, but he did it anyway. All he hoped for was to start some dialogue, he said. One sports columnist said it was such a shame that Brendan couldn't see how it turned out. The world is changing. Bigotry is so passé, the collectivistic-tribalistic view of the world is not fit for survival. It may still be bolstered by unthinking appeals to the supernatural as expressed in some antiquated theology from a darker, colder age of humanity. But it is rapidly dying out. That some people haven't yet figured that out is their loss. posted by blog owner at 2/07/2010 10:23:00 PM DiggIt! Reddit Del.icio.us Slashdot It!